Hey guys! I wasn’t going to post this outfit on here but I took a couple shots when my brother and I were running some errands yesterday. I brought my camera and I thought, “why not turn this into a photo day”. 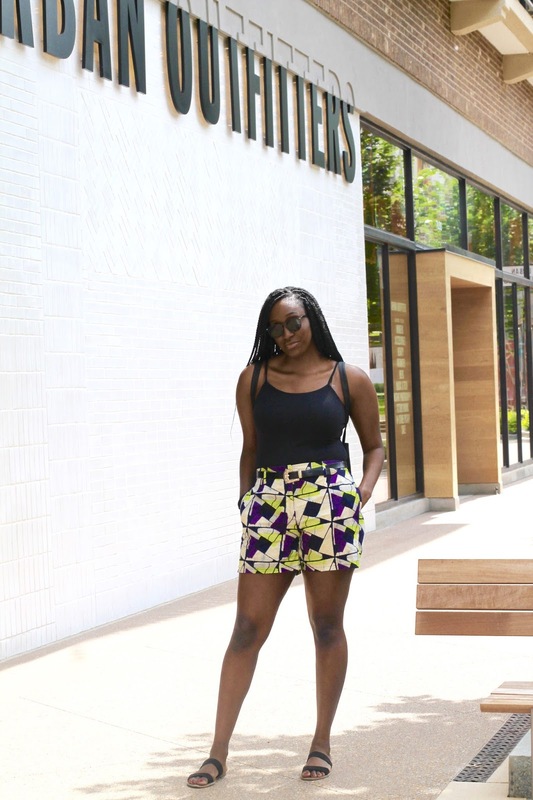 I wore a simple black cami with my ankara print shorts that I have had for like 5 years now. I’m very happy they still fit. I feel I haven’t talked to y’all in a while. So, what’s new? This summer has been very low key. Just hanging out with my family and catching up with some friends from high school. I went to a wedding last weekend, which was fun. It was a Nigerian and Haitian wedding. I loved being surrounded by so much culture. Such a beautiful couple! I have also been spending a lot of time creating content for my Youtube. That is still so weird to me. I finally have a Youtube channel. Feyi of a couple months ago would laugh in your face if you told her she would be filming videos for YouTube. That creative space is still weird to me but I’m loving it. Anyways, hope you are all doing well. How’s summer treating ya?